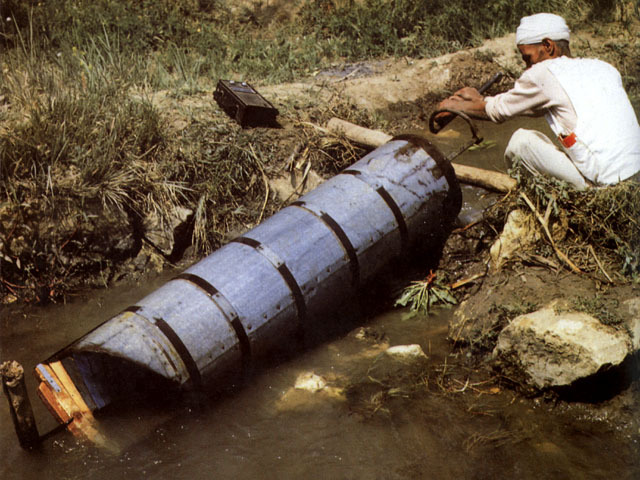 An Egyptian farmer turning an Archimedes screw by hand to irrigate a field. Photograph by Helen and Frank Schreider of the National Geographic staff. Enlarged View: 102 kilobytes, 640 x 480 pixels. 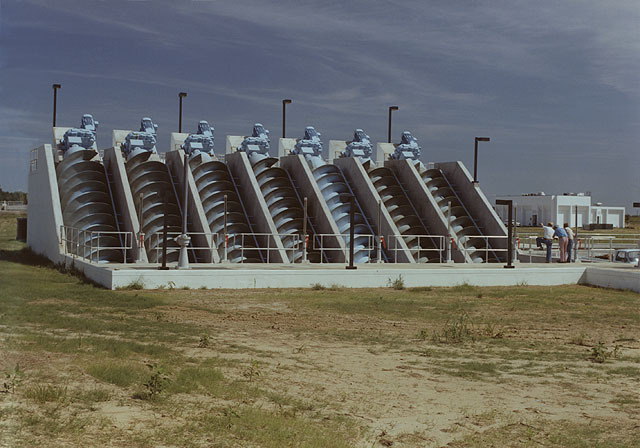 Seven Archimedes screws pump wastewater in a treatment plant in Memphis, Tennessee, USA. Each of these screws is 96 inches (2.44 meters) in diameter and can lift 19,900 gallons per minute. Manufactured by Lakeside Equipment Company of Bartlett, Illinois, USA. Medium Size: 75 kilobytes, 640 x 448 pixels. Large Size: 795 kilobytes, 2845 x 1993 pixels. The J.U. Smitgemaal pumping station in Kinderdijk, Holland, used to drain water from the Alblasserwaard polders (lowlands reclaimed from the sea) into the Lek river. 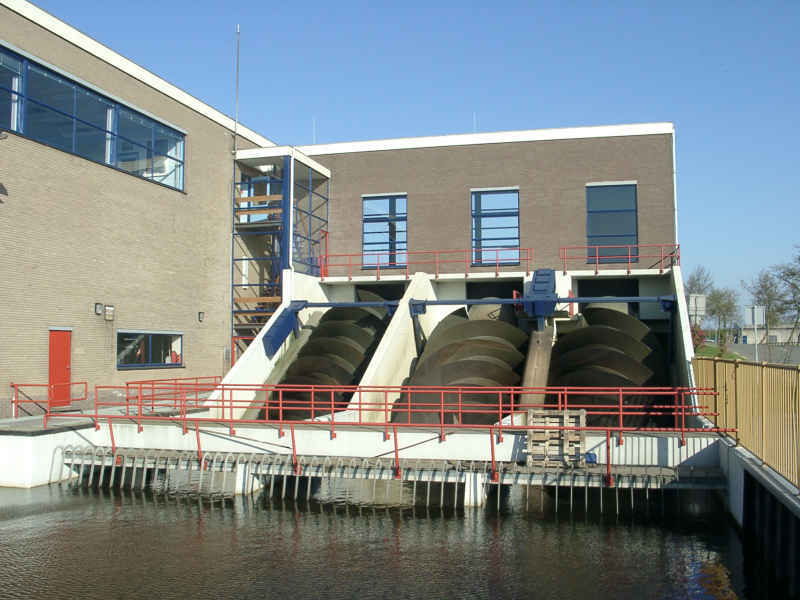 Built in 1972, its three diesel-driven Archimedes screws have a capacity of 1.35 million liters per minute. This pumping station does the work of 19 windmills dating from around 1740. These windmills are still standing, earning Kinderdijk the title of the windmill capital of the world. Enlarged View: 55 kilobytes, 800 x 600 pixels. 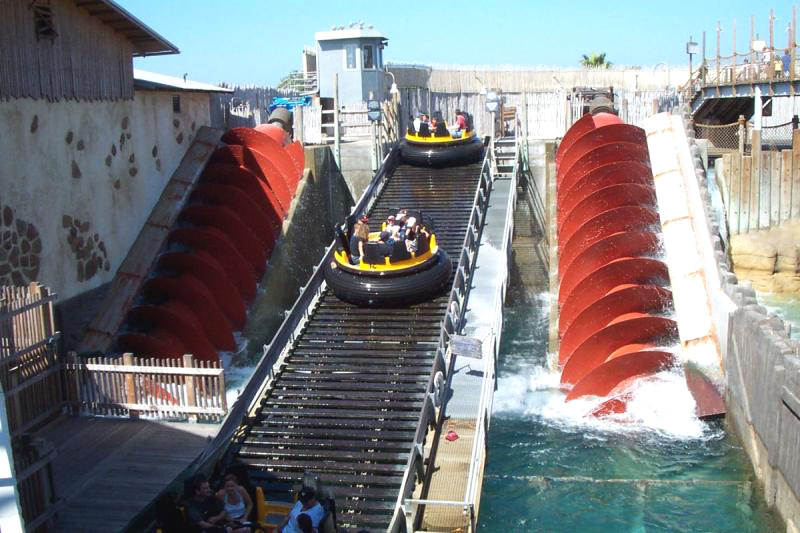 Two Archimedes screws in SeaWorld Adventure Park (San Diego, California, USA) used to lift water for the Shipwreck Rapids water ride. Enlarged View: 156 kilobytes, 800 x 533 pixels. 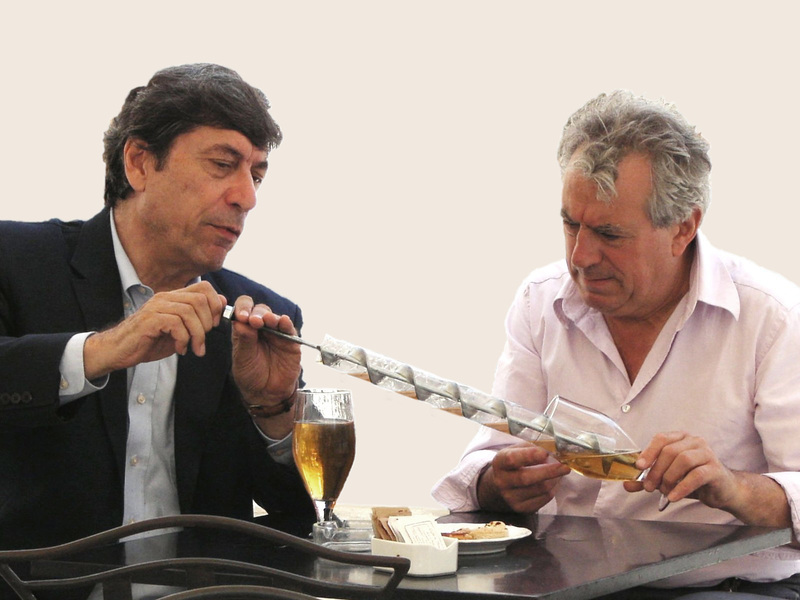 The WebMaster (Chris Rorres on the left) shows Terry Jones how an Archimedes screw can be used to transfer beer from one glass to another. This still, taken in Syracuse, Sicily, in 2005, is from a television documentary series entitled “Terry Jones’ Barbarians”, first broadcast in 2006. Enlarged View: 302 kilobytes, 1600 x 1200 pixels.